Okay, I'm sure I'm not the only one out there lately that is dealing with tired and emotional roller coaster children these days. With the school year in session my kids are up and down with all sorts of emotions. Even though it can be draining at times we reassure them that no matter what their little attitudes do to us that we love them unconditionally. 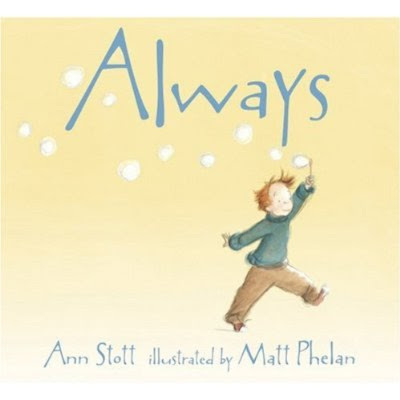 Have you heard, seen or read this book called Always by Ann Scott? It's a sweet little book that shares the joy of unconditional love no matter what sort of things your child does. Little sayings like, "Do you love me when I eat my peas? Do you love me when I don't?" Not only does it have the sweetest little message but, the simple illustrations are so darling and they convey the message perfectly. My kids have it offered in their Scholastic magazines through school but, it's on Amazon as well and priced for $11.99.